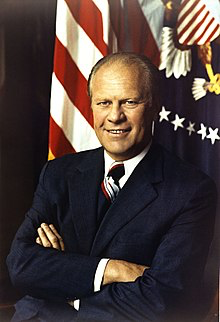 In 1975 President Gerald Ford signed the Indochina Migration and Refugee Assistance Act, a significant piece of immigration legislation that aided immigrants from regions affected by the Vietnam War in the aftermath of the April 30, 1975 Fall of Saigon and withdrawal of U.S. troops. Because of the act, the number of new legal permanent residents in the U.S. climbed from 385,378 in 1975 to 499,093 in 1976. The act allocated $405 million to aid the evacuation and resettlement of 130,000 Vietnamese refugees, and later expanded refugee definition to include those fleeing Cambodia, Vietnam and Laos. Amendments to the 1965 Immigration and Nationality Act were also passed in 1976 and signed by Ford. These included the Western Hemisphere in the preference system and 20,000-per-year visa limits, effectively halving the number of legal immigrants allowed from Mexico each year.